Serving a Grilled Pacific Snapper with French Style Butter Sauce for Easter! Sometimes deciding which fish to serve to your family can be a challenge. I know that for a fact. Some of my family members don’t like fish, but I have found that when serving mild white fish and cooking it on the grill makes a difference in flavor. I found the Pacific snapper in the frozen aisle at the supermarket. I chose the wild caught option. This fish is firm, good for grilling and frying too, and has a delicate flavor. I was surprised by how easy it is to cook this fish. 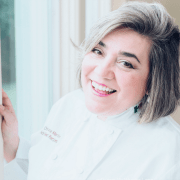 I used the stovetop grill, and the results were fantastic. 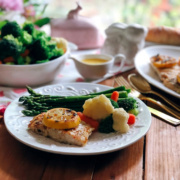 Not to mention the grilled Pacific snapper dish comes with a generous portion of steamed veggies and asparagus drizzled with a delightful French-style butter sauce. 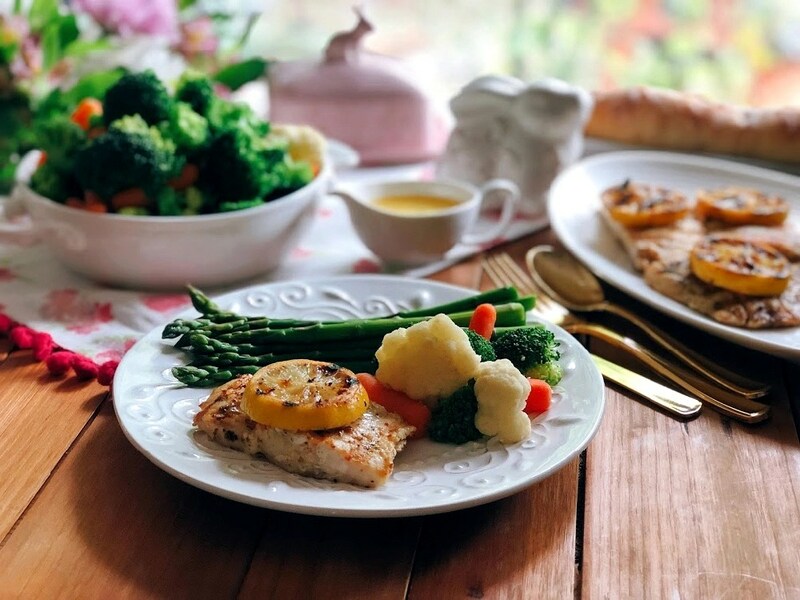 This grilled Pacific snapper dish makes an elegant meal appropriate for an Easter menu or a springtime dinner party. 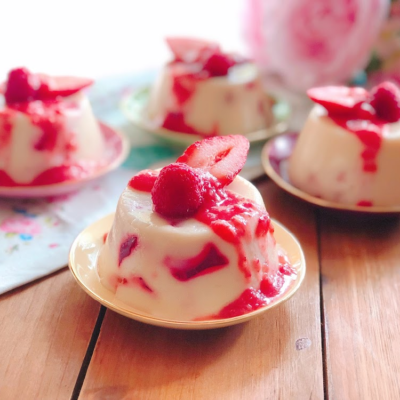 It is relatively easy to make, moderately priced, and those picky eaters will devour it. I seasoned the fish with paprika, black pepper, oregano, and salt. I am steaming the veggies, and the asparagus get a quick blanching on boiling water. I am not adding any condiments to the vegetables as the butter sauce with add the flavor to complete the dish. This meal takes a few minutes to put together, and everyone will be wowed with the tasty and the presentation. Make the Grilled Pacific Snapper Today! If you are not able to find rockfish or Pacific snapper opt for cod, red snapper or mahi-mahi. All are white meat, and the flavor profile is mild for those sensitive to fishy flavors. 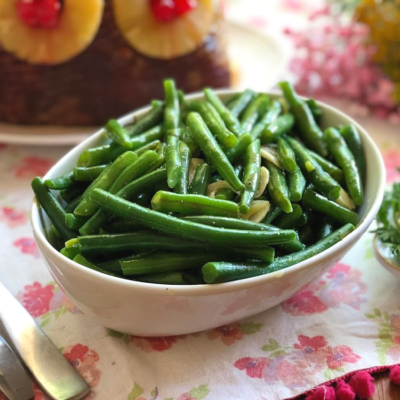 The vegetables can be chosen based on your family’s taste buds too. 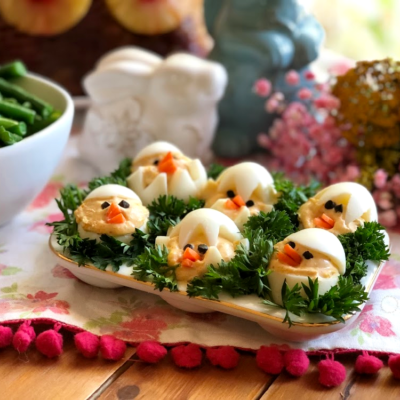 If they prefer potatoes, I recommend roasted potatoes or garlic mashed potatoes, and you can add a salad using fresh seasonal ingredients in your area. We are serving a Grilled Pacific Snapper with French Style Butter Sauce for Easter!﻿ The fish is seasoned with paprika and other spices. What makes this dish unique is a homemade beurre blanc sauce and the freshness of the ingredients being used. If using frozen fillets of rockfish or Pacific snapper defrost the fish following the package instructions. Season the fish fillets with olive oil and a mix made with paprika, oregano, black pepper, and salt. Using a grilling skillet to cook the fish but you can opt for traditional grilling method too. Grill the fish with the lemon slices for 4 minutes on each side and set aside. Fish is ready when reaching an internal temperature of 145°F. 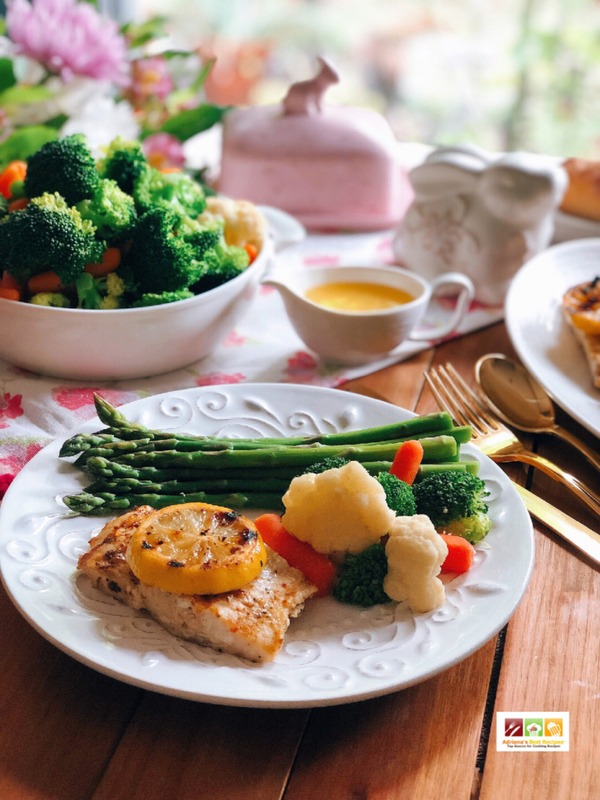 Serve the grilled Pacific snapper with your favorite steamed veggies and drizzle with warm French style butter sauce or beurre blanc. As with any fish do not to overcook as fish dries fast specially those with lower fat, such as white meat fish. Other side dishes that pair well with grilled fish are roasted potatoes or garlic mashed potatoes. And add a salad using fresh seasonal ingredients in your area. 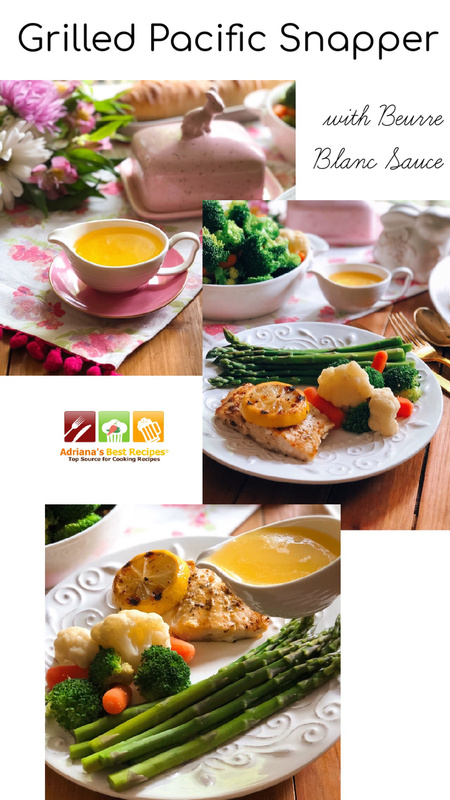 Check the full recipe for the French style butter sauce. 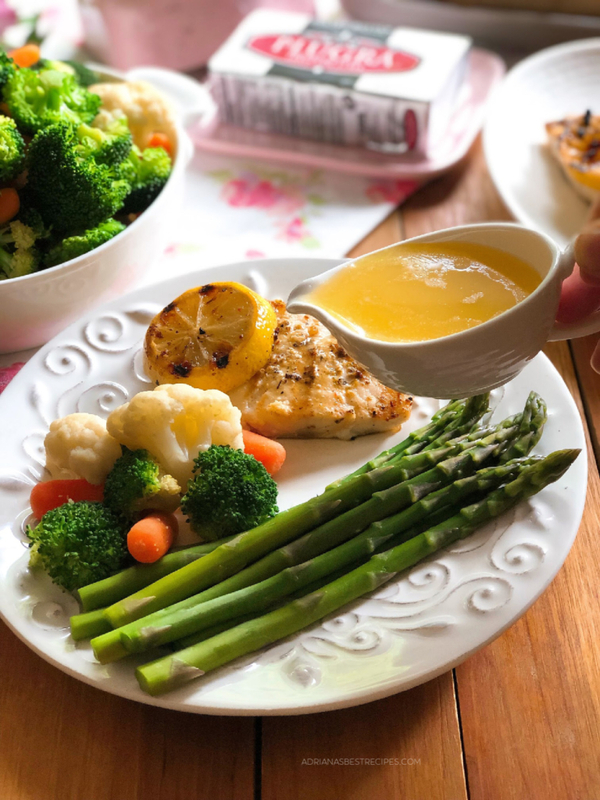 Discover how easy it is to make a beurre blanc sauce! 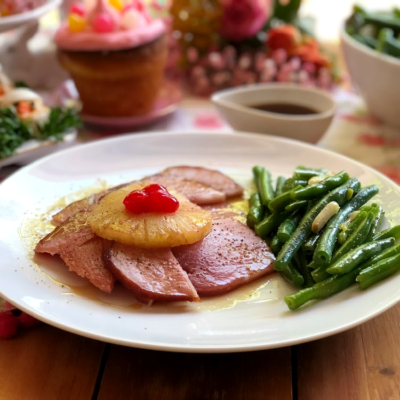 The butter sauce is what makes this dish special so make sure to follow the recipe instructions for the beurre blanc in the step by step video below. I’ve aways been such a fan of lemon paired with white fish! Well, lemon and anything for that matter! This sounds so delicious, can’t wait to give it a try! Yes, grilled lemon adds a nice touch totally agree with you! Fish is one of my favorites. Even better when it’s grilled! You bet grilling is an excellent technique to bring out that fantastic flavor. This looks like such a great way to eat more seafood! There is no doubt that finding the correct fish makes it easier to add it to the menu on a regular basis. I agree – grilled fish tastes better and will make some people who aren’t thrilled about fish convinced to eat it. And pouring over a butter sauce? Delicious! Couldn’t agree more that butter sauced makes the dish very special and delicious. Thanks for this recipe. I love eating fish, but I really don’t know much about the different kinds of fish. One of my boys really dislikes the taste of it. He might like one of the options you gave. Thanks! Thanks for stopping by no doubt that kids are the one more sensitive to fishy flavors. That is why I enjoy fish with white meat as those are mild. Mahi Mahi is excellent as well as Pollock. Not to mention this rockfish also called Pacific snapper. This looks so flavorful & healthy! I enjoy using my grill every chance I get! Thanks so much, Jillian this meal is light and well balanced. Looks like the perfect healthy dinner! This looks like a beautiful meal. 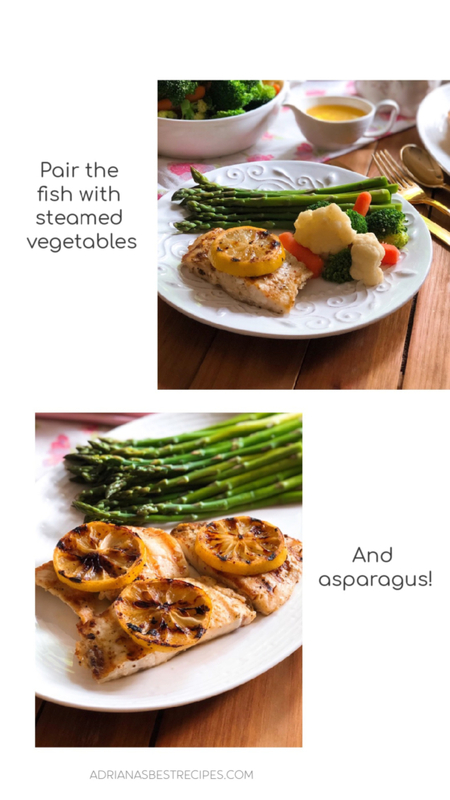 I love grilled fish with asparagus! 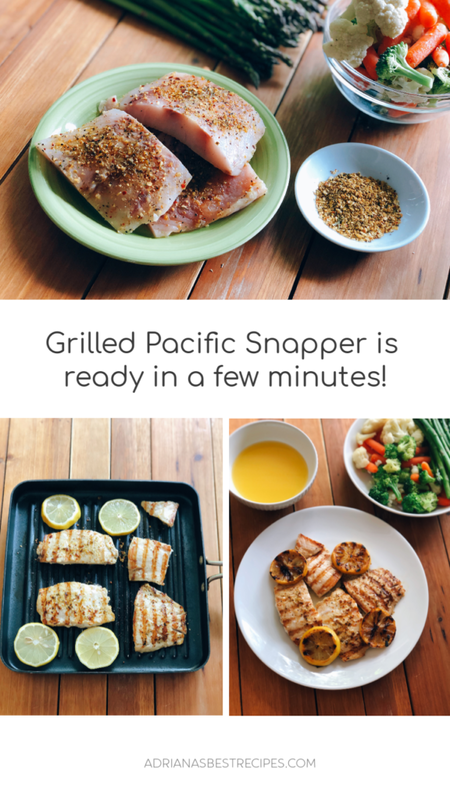 I’ve never had pacific snapper, I’d love to try it! Grilled fish makes a delicious meal, and snapper sounds ideal for this purpose. I find that frozen fish from supermarkets is such good quality that you really don’t have to buy fresh every time. I love the combination of gorgeous vegetables and butter sauce with the fish, altogether a very tasty looking meal.